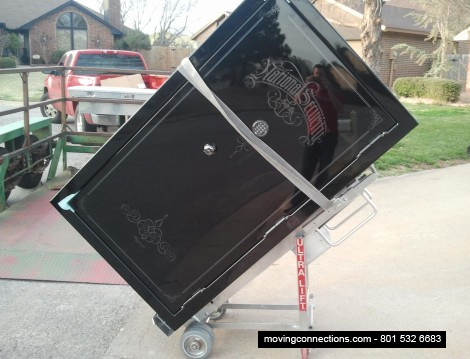 At Moving Connections, we understand that most people want to save money and that often means “Do-It-Yourself”, or “DIY”. The problem is that with tricky and very heavy and expensive items – such as concert grand and baby grand pianos – “DIY” can quickly turn to mean “Destroy It Yourself”. That’s why it’s best to leave such items to the professionals. Keyboards need to be properly padded and secured, legs and the lyre board need to be removed in a professional way and in the proper order, the piano itself needs to be carefully wrapped and padded, then leaned carefully onto a professional grade piano board. From there, the piano needs to be loaded onto the moving truck and strapped securely to the wall where it won’t move or be scratched or bumped by other items. In order to do this, you really need a highly professional, coordinated team who knows how to work together. And it’s best to hire a professional moving company that is federally licensed, bonded, and insured, like Moving Connections. If you would like to discuss the move of your piano with a professional, please give us a call or if you prefer, you can send us an email. We’ll be happy to answer your questions and give you a quick quote estimate for the cost of your move. Sometimes when people move (or for other reasons), they want a pool table put in storage for a period of time. 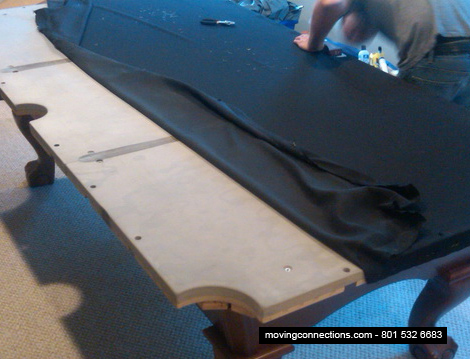 The movers at Moving Connections know how to move your pool table in a professional manner, and we have regular as well as climate controlled storage space available. It’s important to hire a professional moving crew to do certain critical things, and taking down and moving a pool table is one of those things. There are certain issues that must be taken into account to prevent your pool table from being damaged, especially when it comes to the felt and slate. So give us a call if you have any questions or would like a quick quote on the cost of your move. If you need your pool table set back up, we can send somebody to make the leveling adjustments and perform the other required labor and you can pay them directly or pay them through us if you prefer. Moving Connections can provide the muscle and expertise for those heavy items you just can’t get on your own. Another item that is best left to the professionals is your gun safe. This is something that you definitely don’t want to try to move by yourself or without professional equipment. *Moving Connections offers gun safe moving only as part of household moves. Moving Connections farms out gun safes over these weights. With a professional moving crew and an item such as a stairwalker, gun safes can be moved efficiently and without damage to people or property. They can be safely loaded onto a truck and secured to the wall where they will be blanketed, isolated, and professionally strapped in a spot that balances well with the rest of the load. Moving Connections can provide the muscle for those heavy items you just can’t get on your own. For some people, one of their most important furniture items is their beloved hot tub. If you’re one of those who just can’t live without “old comfy” then you should be happy to know that hot tubs can be moved. It can be a trick and depending on the size and shape, it could require more than one crew, but it can be done. 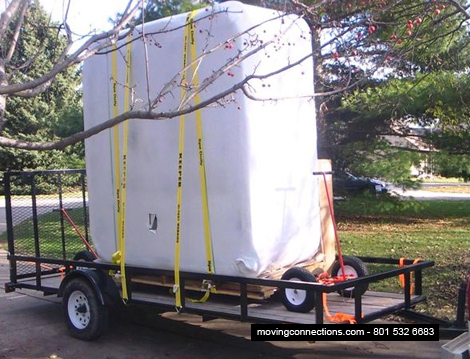 We at Moving Connections have experienced crews that know how to disconnect, properly prepare and move a hot tub. It’s one of those things that we need to coordinate in advance, however, so be prepared to answer some questions about where it’s located, size, accessibility, number of steps we will have to go up/down, and so forth. So give us a call to find out more about your hot tub move and how we’ll go about it, or to get a quick quote on an estimate for your move, including the hot tub.